Tomorrow sees the start of the next round of Rebellion – Julia Buckley’s latest fat loss programme. I finished the last round just 3 weeks ago and was pleased with my results. Julia posted a new video for her clients on the site a couple of days ago as she often does – it’s one of the things I love about training with her – although everything is delivered online she’s got an amazing knack of making you feel like she’s talking just to you. In the video she talked about a fresh start, about approaching this next round of the programme from where we are right now. It seems obvious but it really got me thinking. In the last year or so I’ve spent a lot of time trying to get back to where I was towards the end of 2013 when I turned 40. I was the smallest and lightest I’ve been in my adult life and was really pleased with how I looked and with my fitness levels. I’d run personal best times in all the distances I’d raced over the course of that year and had started to fit comfortably into quite a few size 12 clothes. 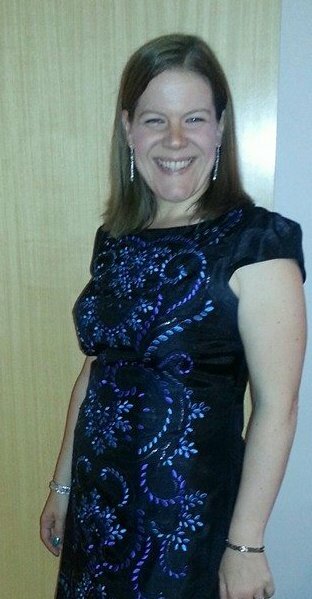 This photo was taken on the evening of my joint 40th birthday with my husband. I’d been so focussed on fitting into that dress. I felt amazing. Then 2014 happened. I ran the London marathon, got injured, stopped running so much and put on a bit of weight. But something else also happened that year. I fell in love with the barbell and started to workout with what I would now call heavy weights. Yesterday I tried on that dress. It was so far off from fitting that I can’t believe I wore it just two years ago. 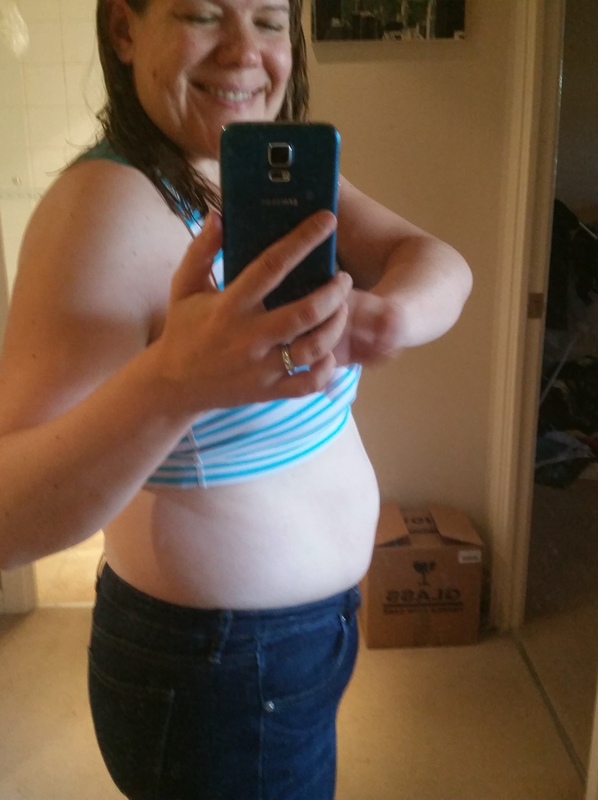 But it wasn’t tight across my problem area – my tummy/waist – that bit fits just fine. It was across the chest, shoulders and back. It’s a good couple of inches away from doing up! It was then that it hit me. My body shape has changed quite a lot in these last two years. I’ve got so much stronger and as a result developed muscles and gained definition that I love. Weight lifting hasn’t made me bulky but it has changed my body shape for sure. It’s quite possible that however lean I now get I’m not going to fit back into that dress. And then I realised that I need to let the thought of getting back into that dress go. I love setting goals but they need to be achievable and losing multiple inches off my chest and shoulders by the end of the year isn’t that. I’m going to keep the dress in my cupboard out of interest but it’s no longer going to be a primary target for me. That was how my body looked in 2013 but it’s now 2015 and things have changed. I need to start from where I am now with goals that reflect the person that I now am. These jeans are my new target. They just about do up but they are mightily uncomfortable and I couldn’t wear them in public. Fitting into them by Christmas feels realistic though and doing so will mean losing fat from the place I want and need to the most. The other thought that’s been circulating around my head since watching that video is that I need to be careful about getting complacent. One of the reasons that I ended up gaining some weight in 2014 was that I didn’t recognise that things had plateaued for me soon enough. I got frustrated with a lack of change in my body but it look a while for me to realise that if I wanted to see progress then I needed to face facts and make some changes. It’s been in these last few months when I’ve mixed up my diet and started planning and tracking my food intake that the fat loss has happened. But as with all things the body adapts. Just because that worked for the in the last round of Rebellion doesn’t mean it will continue to now. I’m leaner than I was, my energy needs might have decreased a bit. I need to recognise where I am right now and decide what I’m going to change from here to see the changes that I want on my body. One of the things that I realised while we were away on holiday was how little I snacked. We were busy, I was occupied and I wasn’t hungry – the thought of snacks didn’t cross my mind. I’m taking that little revelation into this next round of Rebellion. I have a tendency to reach for snacks during the working day without really thinking about whether I’m hungry. So that’s one change that I’m going to make in these next 12 weeks – no snacking unless I’m genuinely hungry! As ever Julia has given me plenty of food for thought. I’ll be starting this round of Rebellion from where I am right now. Back from holiday with tight jeans and ready to get focussed again on some fat loss. If you, like me have tight jeans, or a little black dress that you want to fit into for Christmas then come and join the Rebellion. It all kicks off again tomorrow and I for one can’t wait. Julia is trialling an affiliate scheme – if you sign up via my link you get a better deal than by joining directly on the website (how much better depends on where in the world you are due to complicated tax stuff that I’m not going to claim to understand let alone try and explain). I receive commission from each person that registers via my link. It’s a win win! Looking forward to following your journey Becca!